Letsie III (original name David Mohato Bereng Seeiso) (born July 17, 1963) is the king of Lesotho. He succeeded his father, Moshoeshoe II, when the latter was forced into exile in 1990. The first son of King Moshoeshoe II, Letsie David Mohato Bereng Seeiso was born in Morija, Lesotho. He was educated in Lesotho and the United Kingdom, receiving a degree in law from the National University of Lesotho and degrees in law and agricultural studies from the University of Bristol, the University of Cambridge, and the University of London. Letsie has had a lifelong interest in agriculture, and spends much of his leisure time visiting his familys cattle ranches. In 1990 Lesothos military rulers deposed and exiled Moshoeshoe and enthroned Letsie in his place. Letsie reigned under the control of a military council until 1995, when he backed a palace coup that reinstated Moshoeshoe. A year later, Moshoeshoe was killed in an automobile accident and Letsie again assumed the throne. 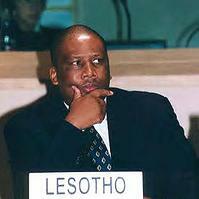 As king of Lesotho, Letsie is the head of state but holds no executive or legislative powers. Like his father, Letsie pledged not to involve himself in national politics. However, during a 1998 political crisis, thousands of demonstrators protested for weeks in front of Letsie's palace in Maseru. The demonstrators claimed that the elections that put prime minister Pakalitha Mosisili in power were fraudulent and demanded that Letsie overrule the results. International observers had deemed the elections fair, however, and the king declined to act. Dozens of people were killed in subsequent rioting, which destroyed much of Maseru. Letsies marriage in February 2000, the largest and most jubilant royal event since his coronation, provided Lesotho a period of national reconciliation.